The following events were publicized for the day of May 28, Memorial Day 2018. If your area is not listed, please check with your local officials. 10AM- The Memorial Day Remembrance Ceremony sponsored by the USS KIDD Veterans Museum will be this Monday at 305 S River Rd, Baton Rouge, LA 70802. The ceremony will be held in the Louisiana Memorial Plaza and is free and open to the public. 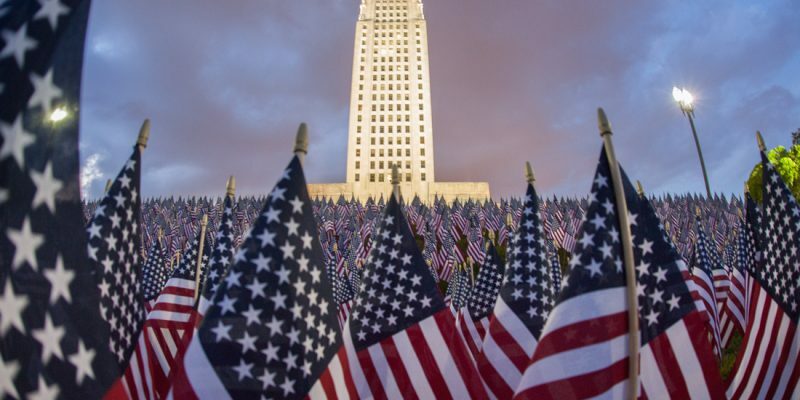 7PM- The Baton Rouge Concert Band- Annual Memorial Day Concert will be held at in North Boulevard Town Square, 222 North Blvd, Baton Rouge, LA 70801. 8AM- Louisiana Department of Veterans Affairs’ Northwest Louisiana Veterans Home will host their Memorial Day Program on Monday, May 28. The NWLVH is located at 3130 Arthur Ray Teague Parkway in Bossier City, Louisiana. 10AM- The Ascension Veterans Memorial Park Foundation will host a Memorial Day observance at Veterans Park in Gonzales at the Park Ampitheater at 612 South Irma Boulevard, Gonzales, LA 70737. 4PM- American Legion Frank Thibodeaux Post 520 will hold a Memorial Day event Monday, May 28, beginning with a parade at 4 p.m. Lineup will be at the corner of South Main and Market streets. 11AM- LDVA’s Northwest Louisiana Veterans Cemetery will host their Memorial Day Program on Monday, May 28 at 7970 Mike Clarke Road in Keithville, Louisiana. They can be reached at: (318) 925-0612. 9:30AM- The Kinder Cemetery Association will present its 23rd annual Memorial Day ceremony and Avenue of Flags on Monday, May 28, at Kinder-McRill Memorial Cemetery, 1610 Kinder Cemetery Road. (All day) The Avenue of Flags at Orange Grove-Graceland Cemetery on Broad Street will be on display from sunrise to sunset, weather permitting, on Monday, May 28. Visitors can walk or drive through the display of over 800 flags which are donated by the families of deceased soldiers. 2PM- The Monroe Memorial Day Parade will step off on May 28 at the corner of Jones Ave. and Monroe Street, ending at St. Mary’s Park. There will be a ceremony at the Monroe Street Bridge immediately following the parade. For information, call the Monroe Post 1138, Veterans of Foreign Wars, hall, 400 Jones Ave., Monroe at 734-242-0526. 11AM- LDVA’s Northeast Louisiana Veterans Cemetery will host their Memorial Day Program on Monday, May 28. The NELVC is located at 2413 Hwy 425 in Rayville, Louisiana. They can be reached at: (318) 728-4346. 2PM- The American Legion will lay a wreath on Cross Lake on Monday at the Lowe-McFarlane American Legion Post at 5315 S. Lakeshore Drive Shreveport, LA 71109. 11AM- LDVA’s Southeast Louisiana Veterans Cemetery will host their Memorial Day Program on Monday, May 28. The SELVC is located at 34888 Grantham College Drive in Slidell, Louisiana. They can be reached at: (985) 646-6458. 9AM- The Vinton Mayor’s Armed Forces committee and Louisiana Army Explorers of Sulphur will hold a Memorial Day ceremony on Monday, May 28, at the VFW Post 9854, 2292 La. 109 South. 2PM- American Legion Post 283 and VFW Post 9046 will hold a service on Monday, May 28, in the Welsh Community Center, 101 Palmer St. A reception will follow in the Welsh Museum, 202 East South St.